The Adina Donovan Home is the recipient of a new wheelchair, walker and lifting device donated by the Rotary Club Sunrise of Road Town. 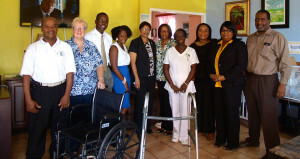 The Home for the elderly was adopted in a great gesture of community service by the Rotary Club and its members presented the items to assist with the mobility of residents and also to help relieve the strain on staff when delivering care. Manager of the Adina Donovan Home, Mrs. Jacqueline Donovan expressed her gratitude on behalf of the management, staff and residents for the donation as well as the adoption by Rotary Club Sunrise of Road Town.